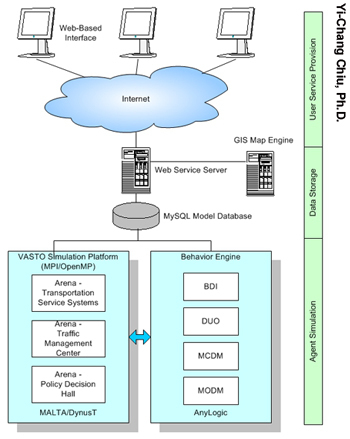 A new Federal Highway Administration (FHWA) Exploratory Advanced Research (EAR) Program study, “VASTO – Evolutionary Agent System for Transportation Outlook,” aims to understand the interactions between travelers, vehicles, traffic management agencies and transportation policies using agent-based modeling and simulation (ABMS). The study, conducted in partnership with the University of Arizona and George Mason University, will aid decisionmaking on transportation investments and contribute to effective management strategies; leading to a safer, more efficient transportation system. Existing traffic simulation models and travel demand forecasting methods are not always able to provide adequate capability when faced with the complexity of today’s transportation systems. For example, these models are often designed to match limited sample survey data and are incapable of interpreting the ongoing effect of new policies or events. Additionally, most current simulation models incorporate only commuters, not taking into account transportation agencies and policy makers—both critical components of the entire system. "We aim to utilize computational and algorithmic advances in other areas as an opportunity to improve our existing analysis capabilities," explains David Yang at FHWA. He continues, "With this study, we plan to develop a theoretically sound, behaviorally robust, and computationally efficient transportation analysis modeling system that seamlessly integrates the concepts of agent-based modeling with existing and emerging simulation tools." The VASTO modeling system incorporates innovative ideas in the area of agent-based modeling, such as the Belief-Desire-Intention model, and is able to model four categories of agents: commuters, commercial operators, traffic management agencies, and policy makers. 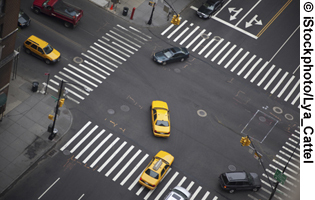 This enables modeling of both users and the managers of a transportation system. The different agents are then able to interact with other agents in any category and these interactions and decisions can be played out in various simulations. The end results can also be integrated with geographic information system data for enhanced visualization. Incorporating the influence and interaction of different agents in a simulation sets VASTO apart from traditional analysis tools and enables a long-term evolutionary outlook for a model with these factors taken into account. The system integrates robust decisionmaking behavior rules from models based on decades of research in decision science, adopts state-of-the-art parallel computational techniques for optimal performance, and utilizes computational geometry techniques to present data in a visual and understandable manner. A multimodal transportation system can be viewed as a hierarchy, ranging from individual travelers at the lower level to traffic management agencies and policy decisionmakers at the top. Interaction models that can take into account the behavioral aspects of both agents making daily commutes and commercial vehicle operators are recognized as the weakest link in existing transportation models and simulation tools. A key focus area for this research team is measuring the interaction rules among heterogeneous agents at a higher level, in which an agency’s management strategy or advocated policy would directly impact the travel behaviors of both commuting and commercial agents. The challenge for this study is to ensure that the ABMS system is sensitive to new policy or traffic management strategies. The ultimate goal of this study is to deliver a set of comprehensive modeling tools, consisting of a database, multimodal transportation simulation platform, multiagent system simulation platform, and efficient data analysis and visualization capability. This will be driven by effective computational geometry, allowing a vast amount of raw simulation data to be processed, stored, analyzed, and displayed. The human-machine interface is also designed to aid the user in achieving the desired model runs, formulate questions to be asked, and select answers to be displayed. The research is expected to lead to the production of a revolutionary system and set of tools for a multiagent system modeling framework. It is anticipated that transportation agencies around the country would greatly benefit from successful deployment of this technology by enabling them to measure the impact of a strategy or policy, such as a higher fuel tax or toll facility, on travel behavior. This VASTO study is expected to ultimately result in several innovative ideas. It will supply fundamental knowledge on how ABMS can be useful for transportation system analysis, it will provide open-source computer programs for other researchers to utilize, and it will attract forward looking practitioners and agencies to try the system to gain insight into test cases. It is anticipated that the modeling system will become a catalyst to jump-start more research and potentially revolutionize the future of transportation modeling and analysis. Yang explains, "This study will explore and demonstrate the capability of agent-based modeling to capture the actions and interactions of various travelers, transportation agencies, and policies." He continues, "Results from this work will advance our ability to realistically mimic various behaviors in a computer-simulated transportation network and examine their impacts." For more information on this EAR Program project, contact David Yang, Ph.D., FHWA Office of Safety Research and Development, at 202-493-3284 (email: david.yang@dot.gov).